What Should I Put on my CV When Applying for Student Jobs? Home > Advice > Applying for jobs > What Should I Put on my CV When Applying for Student Jobs? Writing your first CV can be challenging. You might have lots of experience writing academic essays, but showcasing your own talents in the best light is an entirely different skill. To help you decide what you should put on your CV when for applying for student jobs, we’ve put together this handy guide to complement our student CV template. It's very easy to forget that employers receive thousands of CVs for every job, so you need to make sure yours is informative, persuasive and engaging – in other words, it shouldn't just be a list of everything you've ever done, but a tailored summary of experience and qualifications that are relevant to the job you're applying for. Your CV should begin by displaying all your personal details, including your name, telephone number, email address and location. We strongly recommend that if your email address is at all quirky, cheeky or includes your date of birth, to sign up for a new one. Who do you think an employer will take more seriously, catlover1995@myemail.com or jane.smith@myemail.com? The opening paragraph of your CV should be a personal summary of your achievements, skills, work experience and education. Think of it as a personal statement where you tell employers why they should hire you – so make sure it's written with the job in mind. This part of your CV shouldn’t be too long, keep it short and concise and try to limit it to around 100 words or so. 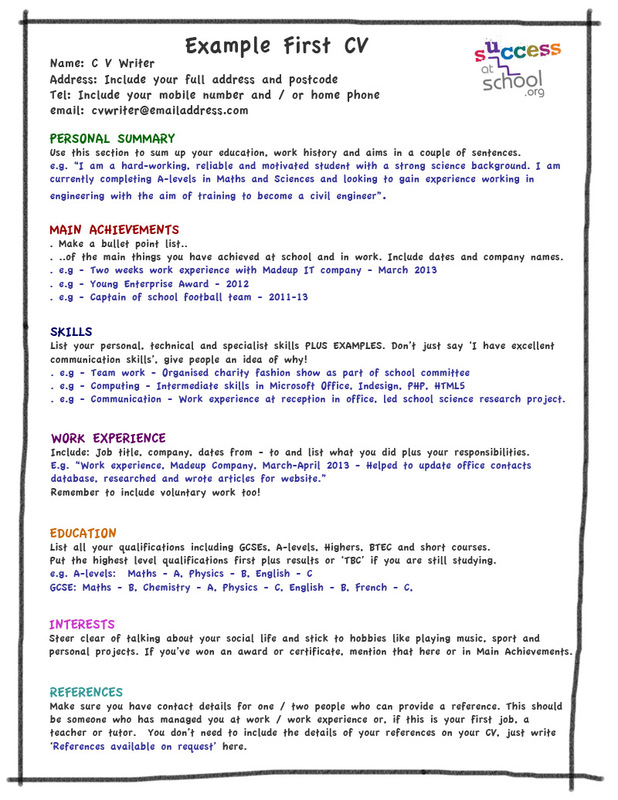 As a student, you may not have a whole lot of work experience to talk about and this might be the first CV you’ve ever written. In which case, focus your achievements on your education or your extra-curricular activities. What an employer wants to see is that you are motivated and have the commitment to see things through until completion. This section should be what sets you apart from other applicants. What are you particularly good at and how will an employer benefit from hiring someone with these skills? Try to be as specific as you can here and rather than saying "I have good communication skills", give examples that show how you have these skills. Depending on the type of job that you’re applying to, you should also make an effort to tailor the Skills section on your CV to reflect what the employer is looking for as set out in the job description. And don't say you haven't got any! You've got loads – and you can read all about how skilled you are in this post on transferable skills. This is often the trickiest part of a CV for students to write. How can you speak about work experience if you don’t have any? Well, the first thing we would ask is "Do you really not have any experience of working, at all?" Perhaps you helped out at a friend or a parent's work for a short while, or maybe you completed a work experience placement at school? Remember, work experience doesn’t necessarily have to mean a full-time job. However, if you really don’t have any experience to write about, you can always write about your experience of helping your family or your neighbours with household tasks. The education section of your CV should list your qualification to date, starting with the most recent. In order to present your CV in the best light, list your qualifications from highest to lowest, so that an employer sees your best results first and has this as their first impression of you. You should also include the name of your school here as well. This part can make or break your CV. Although employers want to know what your interests are outside of work and school, they probably don’t want to know that you enjoy watching soaps and playing video games. Be selective in what interests you put on your CV and try to choose hobbies that relate to working in some way. For example, if you’re applying for an administration job, you might want to mention that you have an interest in writing and using technology. It’s important that whoever you decide to use as a reference for your CV is aware of this. The last thing you want is for an employer to phone your reference only to be told that they weren’t aware they would be contacted. A reference can be a previous employer or a school teacher but definitely not a friend or family member. In some cases, you may not want to display your reference’s personal details on your CV, so you can simply write "References available on request" in this section. Tags: what should I put on my CV as a student? what should i write on my cv if I have no experience?